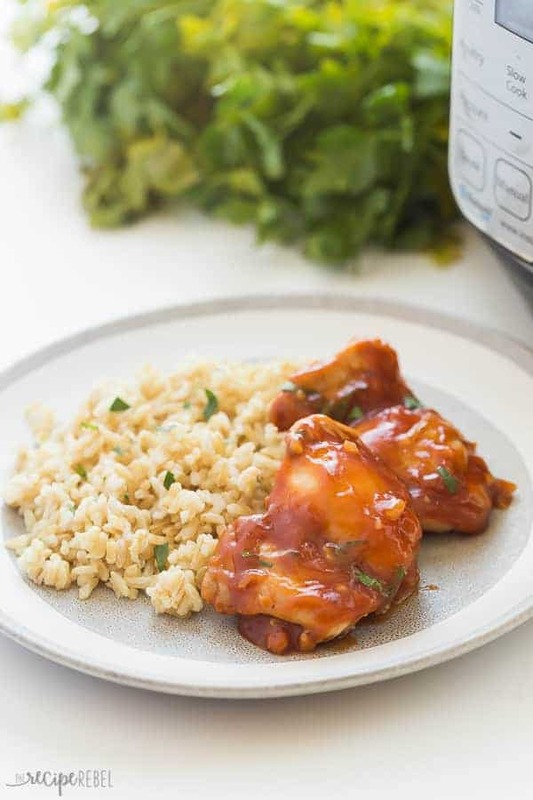 You are here: Home / Mains / BBQ Instant Pot Chicken Thighs: from FRESH or FROZEN! 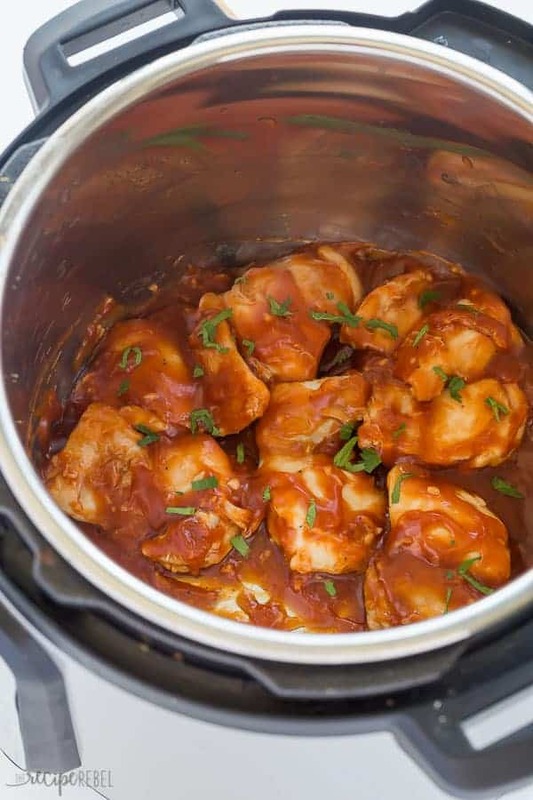 BBQ Instant Pot Chicken Thighs: from FRESH or FROZEN! These Instant Pot Chicken Thighs are an easy, healthy dinner made right in your electric pressure cooker! Add your own sauces and seasonings or bbq sauce. Quickly and easily cook chicken thighs in your Instant Pot from FRESH or FROZEN, bone in or boneless — no need to thaw! I know, I know. We’re mixing things up a little with these Instant Pot Chicken Thighs today. Around here, you see a lot of chicken breast recipes, and that is primarily because they are lean, easy to cook, and relatively inexpensive. I often buy a giant box and it lasts us a month or so in the freezer. 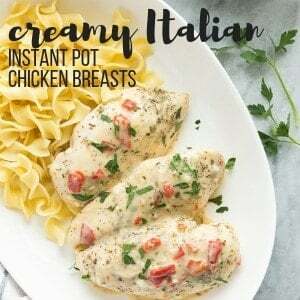 This post on How to Cook Frozen Chicken Breasts in the Instant Pot has been so popular that I knew I needed to brand out a little! 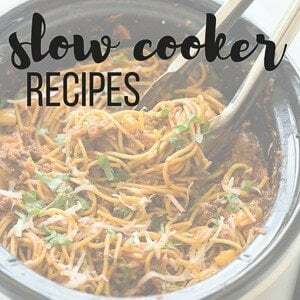 Since then, I’ve experimented with cooking an Instant Pot Whole Chicken from frozen, frozen and partially frozen Instant Pot Pork Tenderloin, as well as using frozen ground beef in the Instant Pot to make taco meat. And I’m just getting started! If you have an electric pressure cooker, I’d love to hear what your favorite things to make are. I’m always looking for new ideas! And if you’re looking for more dinner inspiration, check out these chicken thighs recipes from the Food Network! Because I’m all about EASY these days (the 5 month old baby limits my dinner prep time! 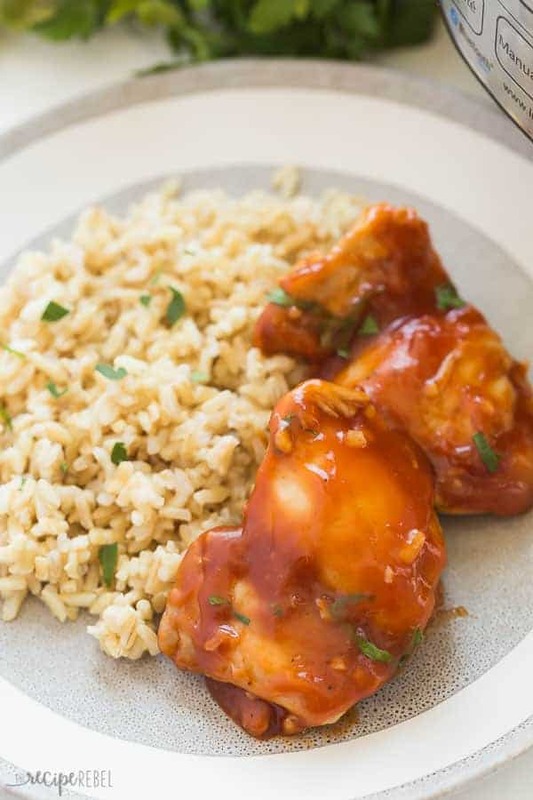 ), I normally use boneless chicken thighs in this Instant Pot recipe. The difference in cook time is significant, so make sure you read through thoroughly. I pretty much always use skinless chicken, because I know I’m not going to eat the skin anyways. The choice is up to you, though, as skin or no skin won’t affect cook time. You will, however, really want to make sure you brown it well first on saute! If you choose to brown your chicken before pressure cooking, it’s important to deglaze (scrape the bottom of the pot) well first so that you do not get a burn notification. Simply add the chicken broth while on saute, wait for it to get hot, and then scrape the bottom of the pot well with a sturdy spoon. I like to cook my chicken breasts or chicken thighs in the Instant Pot with chicken broth and simple seasonings, and then add thicker sauces and finishing seasoning or spices at the end, after it is cooked. The reason for this is that thick liquids can clock up the steam release valve and cause a burn notification if the sauce sticks or begins to caramelize on the bottom of the pot. No one needs that head ache! I’ve included a super simple homemade bbq sauce that we use to glaze the chicken thighs after cooking. Feel free to use my recipe, or serve with your own favorite sauces or seasonings, or simply shred the chicken for salads and sandwiches. To cook frozen chicken thighs in the Instant Pot, you will have to adjust the cook time and it will take longer to come to pressure. You will also not brown the meat first if cooking from frozen. Some people say that it doesn’t take any longer to cook meat from frozen in the pressure cooker, but I have done numerous, numerous tests on whole chickens, chicken breasts, chicken thighs, pork tenderloin and ground beef and I have not found that to be true. You do need to increase the cook time. For frozen chicken thighs, increase the time by 5 minutes for a total cook time of 12-13 minutes. *I tested this recipe with bone in chicken thighs weighing about 150-175 grams or 5.3-6.2 ounces. To cook fresh bone in chicken thighs: You will follow the same directions, but the cook time for bone-in chicken thighs is 10 minutes plus 10 minutes natural pressure release. This means when the timer goes, you press off or cancel and let the pressure release gradually. To cook frozen bone in chicken thighs: You will follow the same directions, the cook time for bone-in chicken thighs from frozen is 15 minutes plus a natural pressure release of 10 minutes. Note that the skin will not be crispy, so you can choose to either remove it before or after cooking. I scrape it off after, because it adds moisture to the meat during the cook time and comes off more easily after cooking. These Instant Pot Chicken Thighs are an easy, healthy dinner made right in your electric pressure cooker! Add your own sauces and seasonings or bbq sauce. Quickly and easily cook chicken thighs in your Instant Pot from FRESH or FROZEN -- no need to thaw! Season both sides of the chicken thighs with salt and pepper. OPTIONAL: Turn Instant Pot to saute and wait until it says "hot". Add 1 tablespoon oil, and brown chicken thighs on each side for 1-2 minutes per side. Turn off. If you brown the chicken, you'll need to make sure the bottom of the pot is clean before starting to pressure cook -- see notes above. Add chicken broth, close the lid, turn the valve to sealing, and set to Manual, high pressure, for 8 minutes. Once the cook time is up, turn the Instant Pot to off and let pressure release naturally for 10-15 minutes. Reserve 1/2 cup of the cooking liquid and drain the rest. Stir together the ketchup, honey, Worcestershire sauce, corn starch, vinegar, garlic, mustard and reserve cooking liquid. Pour into Instant Pot and turn to saute. Let cook until thickened, about 1-2 minutes. Serve immediately. You don’t mention whether you should do a natural release after cook time and if so, how long? Sorry! I will update the recipe. Always a natural release with meat, especially chicken. I would let it release for 10-15 minutes. I made this using one pack of frozen boneless organic chicken thighs from Costco. It was a solid block of frozen chicken and after cooking 13 minutes and letting it come to natural release it wasn’t to an internal temp of 165. So i sautéed it with the bbq sauce and then turned it off and loosely covered it until it came to temp. It was “amazing”, my hisband’s words. Thanks Debi! I’m so glad you liked them! It’s a pretty small amount so I think balsamic would be fine! No worries! I hope you enjoy them! Hi. I want to try this! 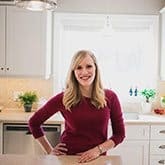 If you are using frozen, do you skip the sauté part or do anything differently? OMG! So finger lickin good! I made with 4 FROZEN thighs…worked perfectly, and now I have extra sauce for tomorrow…maybe on rice. Seriously good sauce. If I double the recipe, do I use he same time for frozen chicken thighs? As long as they are not stacked right on top of each other. If they are stacked directly on top of each other, the overlapping chicken will take longer to cook. If you can stagger them, then it shouldn’t take any longer. I would do a natural pressure release for all kinds of chicken. I hope that helps! These were perfectly cooked and the sauce was amazing! 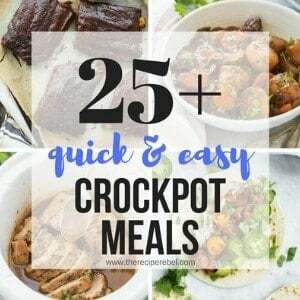 I love how much easier dinner id with the Instant Pot! This chicken looks amazing! Nothing beats a good instant pot chicken! I would put this BBQ chicken on literally EVERYTHING!